This begs the question as to whether a stylist charging $75 – $100 for a haircut should be tipped on top of that. Should restaurants pay their wait staff more in order to relieve the public burden of compensating for their minimum wage salaries? And why must one tip more to the waiter who served prime rib than to the waitress who served a bowl of soup? There are differing opinions, but what is clear is that tipping grants us favor in the eyes of the recipients, be it the Maitre d’ at our favorite restaurant on a busy Saturday night, a haul–off of that curbside refrigerator (that was against the rules), a babysitter who rearranges their evening to accommodate, or a last minute squeeze into the hairstylist chair. I always tip and play by the rules, but should it always be expected? 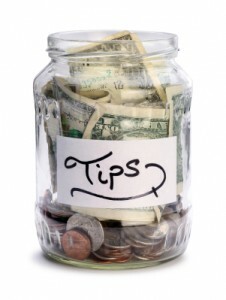 What are your views on tipping?